Diabetes mellitus is a common metabolic disorder found in 382 million people around the world. Hyperglycemia is the main characteristic of this disease. This condition is a result of an absolute deficiency of insulin secretion (type 1 diabetes) or abnormal pancreatic β-cell function affecting insulin secretion, including insulin resistance (type 2 diabetes). This disorder also causes various complications in other systems, causing many diseases such as coronary heart disease, hypertension, nephropathy, retinopathy, and peripheral neuropathy., Elevated blood glucose level also induces the production of free radicals, causing oxidative stress that injures the liver and leads to carbohydrate metabolism disorder. Although insulin administration is available as a basic remedy for diabetes, insulin injection before meals every day is not desirable. Oral drug administration, another diabetic treatment, has been reported to have some adverse side effects after long-term use. Therefore, maintaining blood glucose level during long-term treatment without (or with fewer) undesirable effects, the ultimate goal for diabetes therapy, should be investigated further. Medicinal plants are alternative treatments which are widely used in many countries. In Thailand, various traditional medicinal plants capable of curing diabetes are available, such as ivy gourd (Coccinia grandis (L.) Voigt), garlic (Allium sativum L.), holy basil (Ocimum tenuiflorum), and bitter cucumber (Momordica charantia L.).,,, Some plants in Cissus genus, woody vine, such as veld grape (Cissus quadrangularis), princess vine (Cissus sicyoides), Cissus multistriata, Cissus cornifolia, and Cissus rotundifolia have been reported having antidiabetics effects also.,,,, Cissus modeccoides (CM) Planch. is a woody vine that is distributed throughout the parts of Thailand, Cambodia, Vietnam, and China. This plant is utilized to treat bone and joint pain, headache, swelling, and boils and also as laxative agent. In Lamphun Province, Northern Thailand, this plant is used in folk medicine as an antidiabetic agent. However, little is known about the effects of this plant on the animal and human body with no scientific evidence supports the medicinal use. Therefore, the objective of this study was to find out the effects of CM aqueous extract on blood glucose level, in parallel with the toxicity of this plant to the pancreas, liver, and kidney in alloxan-induced diabetic rats. CM samples (leaves and stems) were collected from Lamphun, Thailand, identified and confirmed by the taxonomist, Dr. Angkana Inta. The voucher specimen was deposited at Queen Sirikit Botanical Garden (WP6390). The water extract of CM was prepared by weighing dried plants (120, 180, and 240 mg) and boiling in water (1 L) for 1 h to produce various concentrations of the extracts. After boiling, the missing volume of the extract was then added by hot water. The extracts were filtered and cooled to room temperature. Fresh extracts were prepared daily. Male Wistar rats (4 weeks old, 200–250 g) were obtained from the National Laboratory Animal Center, Mahidol University, Nakhon Pathom, Thailand. All rats were kept in a room under controlled temperature (25°C ± 2°C) and light (from 6 am to 6 pm) with ad libitum access to water and food. The experiment was ethically conducted and approved (Re 002/09) by the Institutional Animal Care and Use Committee, Department of Biology, Faculty of Science, Chiang Mai University, Thailand. Diabetic rats were induced by intraperitoneal injection of alloxan (Sigma, USA) at 200 mg/kg body weight. Twenty-four hours after alloxan injection, rats with blood glucose level ranging from 250 to 300 mg/dL were utilized in this study as diabetic rats. Group V: Diabetic rats; given CM extract at 240 μg/mL/day. At the end of the study, overnight-fasted rats were sacrificed. Whole blood samples were collected by cardiac puncture method. Liver, pancreas, and kidney tissue samples were collected and stored at −80°C for gene expression analysis. Blood glucose level was measured from serum using o-toluidine reagent. Whole blood samples were evaluated for complete blood count including hematocrit, hemoglobin (Hb) concentration, red blood cell (RBC) count, and white blood cell (WBC) count. The blood chemical profile for blood urea nitrogen (BUN) and cholesterol was examined at the Division of Clinical Chemistry, Department of Medical Technology, Faculty of Associated Medical Sciences, Chiang Mai University. Six genes related to diabetes were chosen in this study to determine the expression levels in three different tissues (pancreas, liver, and kidney). For the pancreas, insulin 2 (Ins2) and insulin receptor (InsR) genes were selected. Insulin receptor substrate 2 (Irs2) and glucose transporter 2 (Glut2) expression were measured in liver tissue. Detection of nephrin (Nphs1) and transforming growth factor-beta 1 (TGF- β 1) expression levels in the kidney was performed. Total RNA was isolated using an innuPREP DNA/RNA Mini Kit (Analytik Jena, Germany) according to the manufacturer's protocol. cDNA was synthesized by RevertAid Reverse Transcriptase (Fermentas, USA) using 1 μg of total RNA of each sample. Reverse transcription was carried out using a two-step protocol by annealing 10 nmol of oligo dT16 with total RNA at 65°C for 5 min. Then, the reaction was added to a mixture containing 1X buffer, 1 mM dNTPs, 40 units RiboLock RNase Inhibitor (Fermentas, USA), and 200 units RevertAid Reverse Transcriptase to make a final volume of 20 μL. The mixture was incubated at 37°C for 5 min and at 42°C for 90 min. The cDNAs were then subjected to a mixture of 1X ThermOne Real-Time Premix with SYBR Green (RBC Bioscience, Taiwan), 0.2 μM of each forward and reverse primer [Table 1], and 20 ng of cDNA sample with a final volume of 25 μL. Amplification of the target genes was conducted using a MyCycler ™ Thermal Cycler (Bio-Rad, USA) with the following thermal conditions: predenaturation at 95°C for 5 min, 45 cycles of denaturation at 95°C for 30 s, annealing at different temperatures [Table 1] for 1 min, and extension at 72°C for 1 min with a final extension at 72°C for 10 min. Fluorescent signals were measured after each extension step. After polymerase chain reaction (PCR) amplification, melting temperatures were generated to verify the quality of PCR products. The threshold cycle (CT) of each sample was calculated and further used for relative expression by the ΔΔCT method. Glyceraldehyde-3-phosphate dehydrogenase (GAPDH) was selected as an endogenous control gene. One-way analysis of variance was used to evaluate the differences among the treatments, followed by Tukey's multiple comparison posttest. Values were presented as mean ± standard error. Statistical significance was considered as P ≤ 0.05. At the end of the experiment, blood glucose of all experimental rats was investigated. 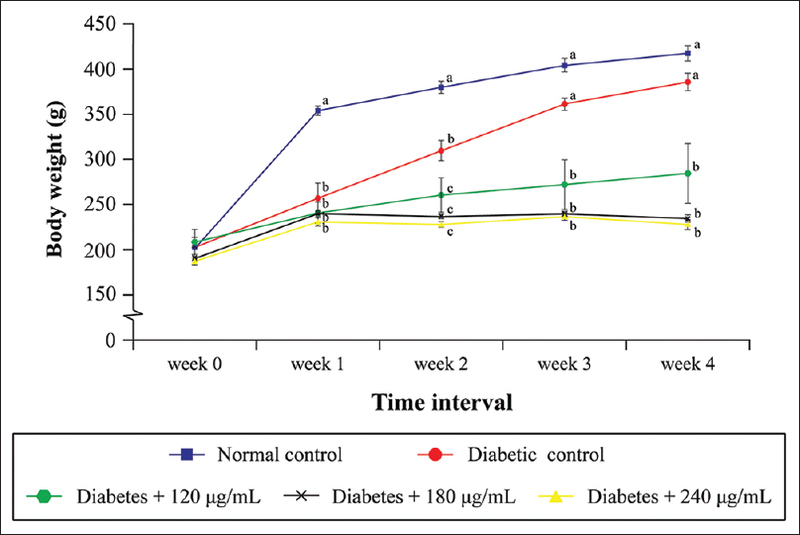 As shown in [Figure 1], CM extracts at different concentrations (120, 180, and 240 μg/mL) did not decrease the blood glucose level of diabetic rats compared with the diabetic control group. However, 180 μg/mL CM extract tended to reduce the blood glucose level when compared with other CM extract concentrations. Body weights of the rats were also checked once a week. The results exhibited a significant decrease in body weight gain from the 1st week of the study in CM-treated groups when compared with the normal control group. The lower body weight in CM-treated rats was prolonged until the end of the experiment [Figure 2]. To examine the toxicity of CM extracts at three different concentrations (120, 180, and 240 μg/mL) in diabetic rats, hematological profiles were analyzed at the end of the study. It was found that the RBC counts of alloxan-induced diabetic rats were significantly lower than the normal control. In addition, the Hb concentrations of diabetic rats receiving 240 μg/mL CM extract were significantly higher than the normal control, while hematocrit was similar, as shown in [Table 2]. Total WBC count of every diabetic rat group was not different from the normal control. However, differences in the numbers of lymphocytes, neutrophils, eosinophils, and basophils were observed. Interestingly, alloxan-induced rats tended to have decreased numbers of lymphocytes, eosinophils, and basophils but increased neutrophils. As shown in [Table 2], although cholesterol levels of every group were not significantly different, it was shown that CM extract probably increased the cholesterol level in a dose-dependent manner. To verify kidney function, BUN was examined. The results showed that BUN was elevated after treatment with CM extracts at 180 and 240 μg/mL. A dose-dependent increase of BUN was also observed. Three different tissues (pancreas, liver, and kidney) were kept for evaluation of the expression level of genes related to diabetes. In pancreas, the messenger RNA (mRNA) levels of Ins2 increased in a dose-dependent manner and significantly differed from the normal control when treated with CM extract at >180 μg/mL. However, a nonsignificant difference in Ins2 levels between the normal and diabetic control groups was demonstrated in this study. In addition, all concentrations of CM extract did not elevate the expression level of InsR in the pancreas [Figure 3]a. In liver tissue, the diabetic controls demonstrated a significant increase of Irs2 and Glut2. After treatment with CM extract, the mRNA levels of Irs2 and Glut2 declined significantly, as shown in [Figure 3]b. Moreover, elevation of Nphs1 in the kidney was found in a dose-dependent manner in all diabetic rats with and without CM extract treatment. However, a significant difference of Nphs1 compared with the control group was found only in the 240 μg/mL treated group. 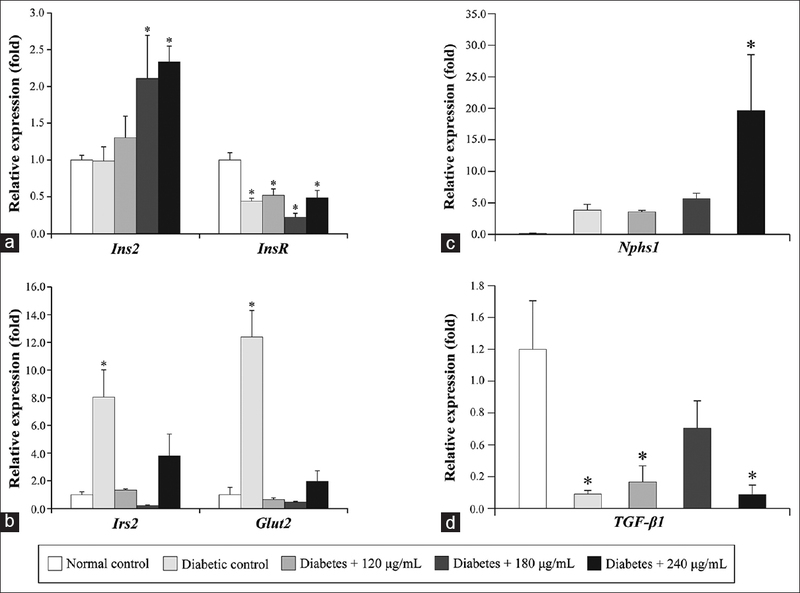 As shown in [Figure 3]c and [Figure 3]d, depletion of TGF- β 1 mRNA level in the kidney was observed in diabetic control rats, including diabetic rats treated with 120 and 240 μg/mL CM extracts. The present study is the first report concerning the pharmacological effects of CM hot aqueous extract, which was employed to imitate the extraction method of CM in folk medicine. After treatment with CM extract at various concentrations in alloxan diabetic rats, a nonsignificant reduction of blood glucose compared with diabetic rats was revealed. These results were in accordance with unimproved body weight of diabetic rats treated with CM extract at 120–240 μg/mL. Although a nonsignificant difference of cholesterol levels in plasma of the CM-treated diabetic rats was shown, cholesterol levels tended to increase in a CM dose-dependent manner. These may be a result of the low expression of InsR in pancreatic cells as well as Irs2 and Glut2 in hepatic cells. Although elevated levels of Ins2 mRNA were found after CM extract treatment at various concentrations, low levels of InsR existed. This may affect insulin secretion because of inadequate and/or abnormal insulin signaling in β-cells, resulting in high blood glucose as found in this study. A decline in expression levels of Irs2 and Glut2 in the liver of diabetic rats after treatment with CM extract may cause high blood glucose level by the depletion of β-cell mass regulator (Irs2) and glucose transporter in hepatic cells (Glut2). Although this circumstance was similar to the decrease of Irs2 and Glut2 by hyperinsulinemia,, hyperglycemia and low body weight were detected in this study. Various complications, for example, cardiovascular diseases, retinopathy, nephropathy, and peripheral neuropathy, typically occur in diabetic patients., Thus, a blood test was performed in this study to determine the effects of CM extract on some pathophysiological features associated with diabetes such as anemia and low immune system.,, The nonsignificant differences in RBC count, hematocrit and Hb concentration between the CM-treated groups and the diabetic group as well as the normal ranges of RBC count and hematocrit  were revealed. This result suggested that CM extract may not lead to anemia, a condition of RBC and/or Hb depletion found in diabetic patients. Moreover, no effects of CM extract on immunity of alloxan diabetic rats was suggested by the nonsignificant differences of WBC count between the CM-treated groups and the diabetic control group. As for the removal of metabolic wastes in blood, an examination of renal aberrations to determine the effects of CM extract was carried out. An elevation of BUN was exhibited. This phenomenon correlated with the increase of Nphs1 mRNA levels in a dose-dependent manner. Nphs1 is a gene-encoding nephrin, a critical transmembrane protein implicating the filtration of the kidney, resulting in protection against albuminuria. The upregulation of Nphs1 may restore the slit diaphragm structure of podocytes., This implied that CM extracts may show some toxic effects on kidney characteristics. The nonsignificant difference of Nphs1 between diabetic and normal control groups also supported this conclusion. In diabetic nephropathy, TGF-β plays a critical role in matrix production leading to glomerular matrix accumulation and loss of filtration in the kidney. TGF-β1 is a well-known cytokine responsible for fibronectin deposition in glomerular and tubulointerstitial compartments. Upregulated TGF- β 1 mRNA have been found in diabetic nephropathy patients. This was in contrast to the depletion of TGF- β 1 expression levels demonstrated in both diabetic control and CM-treated groups in this study. In 2014, Pourghasem et al. observed early renal histological changes leading to diabetic nephropathy after 8 weeks of an experiment in alloxan diabetes using male Wistar rats. This could imply that inadequate duration of the experiment (4 weeks) may be a cause of the low expression levels of TGF- β 1 in alloxan diabetic rats. The results suggested that the CM extract did not affect the accumulation of the extracellular matrix. Likewise, similar levels of Nphs1 in diabetic and control groups may have occurred due to inadequate duration, since the results were in contrast to the low expression level of Nphs1 in diabetic nephropathy patients in previous reports., Nevertheless, only preliminary results were obtained from this study; further studies of other parameters such as liver and kidney functions, histological changes of these organs, and mechanism of CM extract at the protein level should be evaluated to better understand the effects of CM extract on diabetic pathology. The results showed that CM hot aqueous extract did not have a hypoglycemic effect. Moreover, it had adverse effects on some biochemical parameters which suggest the toxicity of CM extract in alloxan-induced diabetic rats. We thank Ms. Piengchanok Faikear, Assistant Professor Salika Aritajat, and Associate Professor Dr. Korakot Nganvongpanit and Mr. Chakkrapong Kuensaen for their kind support. This study was financially supported by the National Research Council of Thailand. Aguiree F, Brown A, Cho NH, Dahlquist G, Dodd S, Dunning T, et al. IDF Diabetes Atlas. 6th ed. Basel: International Diabetes Federation; 2013. Forbes JM, Cooper ME. Mechanisms of diabetic complications. Physiol Rev 2013;93:137-88. Choudhary SK, Chhabra G, Sharma D, Vashishta A, Ohri S, Dixit A, et al. Comprehensive evaluation of anti-hyperglycemic activity of fractionated Momordica charantia seed extract in alloxan-induced diabetic rats. Evid Based Complement Alternat Med 2012;2012:293650. Eidi A, Eidi M, Esmaeili E. Antidiabetic effect of garlic (Allium sativum L.) in normal and streptozotocin-induced diabetic rats. Phytomedicine 2006;13:624-9. Munasinghe MA, Abeysena C, Yaddehige IS, Vidanapathirana T, Piyumal KP. Blood sugar lowering effect of Coccinia grandis (L.) J. Voigt: Path for a new drug for diabetes mellitus. Exp Diabetes Res 2011;2011:978762. Vats V, Grover JK, Rathi SS. 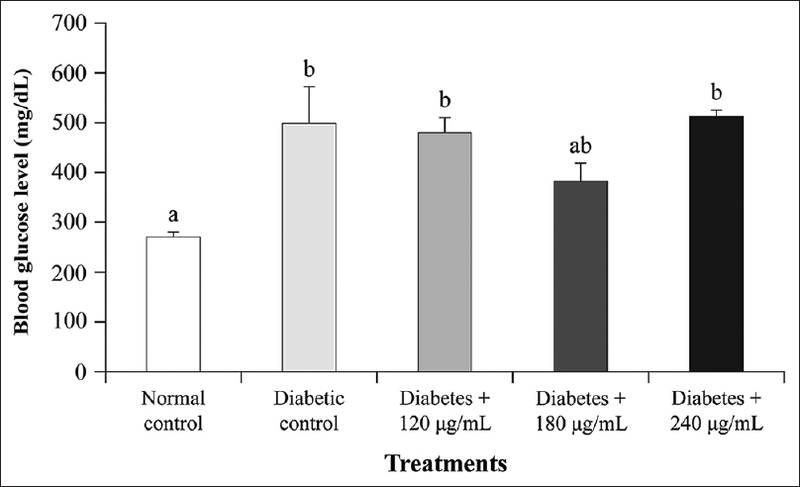 Evaluation of anti-hyperglycemic and hypoglycemic effect of Trigonella foenum-graecum linn, Ocimum sanctum linn and Pterocarpus marsupium linn in normal and alloxanized diabetic rats. J Ethnopharmacol 2002;79:95-100. Lekshmi RK, Divya BT, Mini S. Cissus quadrangularis extract attenuates hyperglycaemia-mediated oxidative stress in streptozotocin-induced diabetic rats. Redox Rep 2014;19:214-20. Pepato MT, Baviera AM, Vendramini RC, Perez Mda P, Kettelhut Ido C, Brunetti IL, et al. Cissus sicyoides (princess vine) in the long-term treatment of streptozotocin-diabetic rats. Biotechnol Appl Biochem 2003;37:15-20. James O, Ogirima YH. Hypoglycemic and wound healing properties of Cissus multistriata leaf extract in Rattus novergicus. Eur J Med Plants 2011;1:50-9. Jimoh A, Tanko Y, Mohammed A. Modulatory role of methanolic leaf extract of Cissus cornifolia on blood glucose levels of normoglycemic wistar rats. Eur J Exp Biol 2013;3:16-21. Al-Mehdar AA, Al-Battah AM. Evaluation of hypoglycemic activity of Boswellia carterii and Cissus rotundifolia in streptozotocin/nicotinamide-induced diabetic rats. Yemeni J Med Sci 2016;10:31-9. Trias-Blasi A, Parnell JA, Chayamarit K. Taxonomic notes on two Cissus (Vitaceae) species in Thailand. Thai For Bull 2009;37:205-11. Ðẹp TT. Loài Cissus modeccoides Planch. (Cây Chìa Vôi) Ho Chi Minh City: Faculty of Medicine – Ho Chi Minh City University of Medicine and Pharmacy. Available from: http://www.uphcm.edu.vn/caythuoc/index.php?q=node/363. [Last accessed on 2018 Dec 28]. Federiuk IF, Casey HM, Quinn MJ, Wood MD, Ward WK. Induction of type-1 diabetes mellitus in laboratory rats by use of alloxan: Route of administration, pitfalls, and insulin treatment. Comp Med 2004;54:252-7. Sasaki T, Matsui S. Effect of acetic acid concentration on the color reaction in the o-toluidine-boric acid method for blood glucose estimation. Jpn J Clin Chem 1972;1:346-53. Livak KJ, Schmittgen TD. Analysis of relative gene expression data using real-time quantitative PCR and the 2(-delta delta C (T)) method. Methods 2001;25:402-8. Burcelin R, Eddouks M, Kande J, Assan R, Girard J. Evidence that GLUT-2 mRNA and protein concentrations are decreased by hyperinsulinaemia and increased by hyperglycaemia in liver of diabetic rats. Biochem J 1992;288 (Pt 2):675-9. Shimomura I, Matsuda M, Hammer RE, Bashmakov Y, Brown MS, Goldstein JL, et al. Decreased IRS-2 and increased SREBP-1c lead to mixed insulin resistance and sensitivity in livers of lipodystrophic and ob/ob mice. Mol Cell 2000;6:77-86. Morello CM. Etiology and natural history of diabetic retinopathy: An overview. Am J Health Syst Pharm 2007;64:S3-7. Pettersson US, Christoffersson G, Massena S, Ahl D, Jansson L, Henriksnäs J, et al. Increased recruitment but impaired function of leukocytes during inflammation in mouse models of type 1 and type 2 diabetes. PloS One 2011;6:e22480. Oyedemi S, Yakubu M, Afolayan A. Antidiabetic activities of aqueous leaves extract of Leonotis leonurus in streptozotocin-induced diabetic rats. J Med Plants Res 2011;5:119-25. Shenoy AG, Goyal RK. Improvement of insulin sensitivity by perindopril in spontaneously hypertensive and streptozotocin-diabetic rats. Indian J Pharmacol 2002;34:156-64. Sharp P, Villano J. The Laboratory Rat. 2nd ed. Florida: CRC Press; 2012. Mehdi U, Toto RD. Anemia, diabetes, and chronic kidney disease. Diabetes Care 2009;32:1320-6. Coward RJ, Welsh GI, Koziell A, Hussain S, Lennon R, Ni L, et al. Nephrin is critical for the action of insulin on human glomerular podocytes. Diabetes 2007;56:1127-35. Kestilä M, Lenkkeri U, Männikkö M, Lamerdin J, McCready P, Putaala H, et al. Positionally cloned gene for a novel glomerular protein – Nephrin – Is mutated in congenital nephrotic syndrome. Mol Cell 1998;1:575-82. Wartiovaara J, Ofverstedt LG, Khoshnoodi J, Zhang J, Mäkelä E, Sandin S, et al. Nephrin strands contribute to a porous slit diaphragm scaffold as revealed by electron tomography. J Clin Invest 2004;114:1475-83. Arora MK, Singh UK. Molecular mechanisms in the pathogenesis of diabetic nephropathy: An update. Vascul Pharmacol 2013;58:259-71. Iwano M, Kubo A, Nishino T, Sato H, Nishioka H, Akai Y, et al. Quantification of glomerular TGF-beta 1 mRNA in patients with diabetes mellitus. Kidney Int 1996;49:1120-1126. Baelde HJ, Eikmans M, Doran PP, Lappin DW, de Heer E, Bruijn JA, et al. Gene expression profiling in glomeruli from human kidneys with diabetic nephropathy. Am J Kidney Dis 2004;43:636-50. Toyoda M, Suzuki D, Umezono T, Uehara G, Maruyama M, Honma M, et al. Expression of human nephrin mRNA in diabetic nephropathy. Nephrol Dial Transplant 2004;19:380-5.